It’s… ASBESTOS!!! | The Fantastic Flame On! Ah, asbestos. It seems more appropriate that this should be the feature of our 500th post at this site. It’s also one of the more appropriate uses of asbestos. 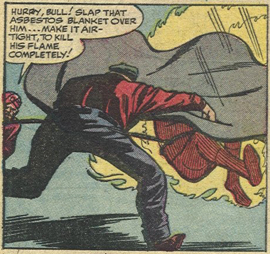 The Beetle is very much a Human Torch villain at this stage in his career, and his suit is designed for combat with our fiery hero. If anyone could sensibly work asbestos into a functional and practical part of his armour, it’s Abner Jenkins, one of the Marvel universe’s most underrated engineers. We are eligible for nomination in the first UK Podcasters Award, in the Games & Hobbies category. Across the month of July, you can visit http://ukpodcasters.com/directory/podcast/the-fantasticast/ and click the nominate button. You can nominate us once per day between now and the end of the month, and we would be very grateful if you would be able to do this. I can’t work out if Stan Lee is, at this point, just taking the piss with his dialogue. A grey door does not signify that it’s made from asbestos, and considering all Bull does with the door is wield it threateningly, it’s hard to imagine how asbestos would have made any difference to the offensive properties of the door – namely, that it’s really big and hard and would hurt if he whacked someone with it. Check out our coverage of Strange Tales #122 on our thirty-first episode: Just Three Of The Guys, with special guest-host Shawn Engel. Some ideas are so crazy, you assume that they’ll stick with you for a long time. I remember asbestos lassos, and asbestos sheet, but for the life of me, I have no memory of reading a comic featuring an asbestos-lined caravan. (Yes, I know the dialogue refers to it as a trailer. But it looks suspiciously like the exact caravan we were bundled into every summer by my Dad, and that would get destroyed on a weekly basis in early seasons of Top Gear). It’s a wonderfully crazy idea. Not only have the Terrible Trio got hold of asbestos rope and asbestos blankets, but somehow they’ve managed to get hold of some kind of easily-applicable asbestos lining. I like to imagine that it was something similar to sheets of vinyl, and they spent ages with credit cards trying to smooth the air pockets to the edge of the sheet. And failing, because let’s face it, the Terrible Trio are completely terrible. The Terrible Trio are back, and the only redeeming feature of their return is that they’ve seemingly stopped off at World of Asbestos for a few accessories before conning Johnny. 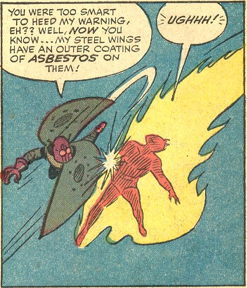 Of course, what they didn’t pick up was a copy of ‘Asbestos For Dummies’ (presumably they thought it would be too high-concept for them), as if they had done so, they’d have learned that the asbestos blanket doesn’t need to be airtight to extinguish the Human Torch’s flame. 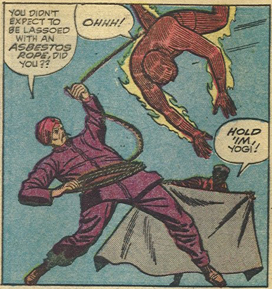 Strange Tales #122: It’s… ASBESTOS!!! This time, it’s an asbestos rope, which the… er… one with the headdress (look, you didn’t expect me to remember their names, did you?) uses to lasso the Human Torch. This rope would go on to have a minor role in the early Marvel Universe, resurfacing in the hands of the Enforcers in the pages of Amazing Spider-Man. It must be the same one – there clearly isn’t a market for mass production! And what’s that being held in the background? The asbestos continues , as an injured Johnny races back into the action. 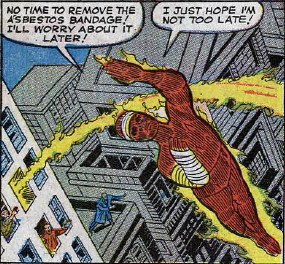 He’s in a rush, with no time to remove his asbestos bandages. 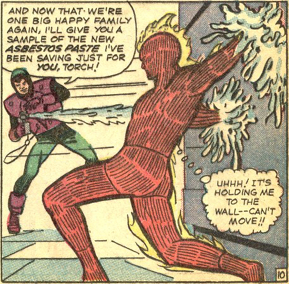 I think we’ll leave aside the incredible unlikelihood of a hospital having a stock of asbestos bandages just in case the Human Torch should happen to be admitted as a patient. Instead, we’ll as what would happen to Johnny’s flight capabilities when his body is not fully flamed. 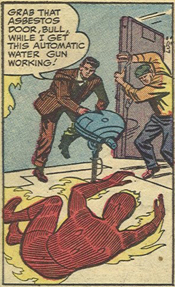 When Johnny was shot by ZANTE during Strange Tales #106, his arm was unable to ignite. His flight was off-balance and he had to compensate for this, as well as flying slower. It’s a little sad to see no acknowledgement of the struggles he would face with an arm not functioning properly, although an argument could be made that he has learned from his previous experience. As that would involve Johnny exhibiting signs of intelligence during the Strange Tales era, I would have to discount that argument. Check out our coverage of Fantastic Four #26 on our twenty-seventh episode: Hulk Goes Home And Plays With His Trains with special guest-host Michael Bailey.